Silver-plated promotional key tag holds home and office keys on one side, car keys on the other. Imagine turning vehicles into moving billboards for your logo, team or event with this 6" round Full Color Custom Car Magnet! It's easy to apply and remove, without leaving any residue. Shine a light with this Translucent Key Shape LED Custom Keychain! It features an extra bright white LED light and comes in 2 colors. Give this extra-strength UL Certified Tablet Custom Power Bank to clients and employees to ensure their devices are always charged! Add your logo to this Dome Custom Tin w/ Stock Shaped Mints! The fun car shaped mints make this the perfect giveaway for dealerships, car clubs, and mechanics. Featuring an extra bright white COB light that has both high and low settings, this COB Light Custom Keychain makes a great trade show giveaway! The split ring attachment attaches easily to keys and zipper pulls. Lock up promotional success with the Padlock Promo Stress Ball. The unique fitted style of this UL Certified Fitted Custom Power Bank allows it to fit neatly in the carry case. With millions of cars stolen each year, auto security companies work hard to protect peoples' vehicles. 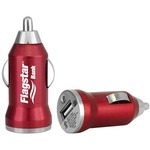 Advertise your services with promotional auto security products from ePromos. 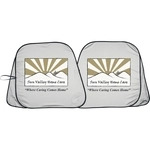 Promotional visor eyeglass holders and custom promotional car sunshades provide great brand visibility. Personalized flashlights and auto emergency kits will keep your clients safe in sudden emergencies.